Reality can sure bite. And I am not the only one who thinks that is the case. “Few people are logical” wrote Dale Carnegie. “Most of us are prejudiced and biased. Most of us are blighted with preconceived notions, with jealousy, suspicion, fear, envy, and pride. And most citizens don’t want to change their minds about their religion or their haircut or communism or their favorite movie star. So, if you are inclined to tell people they are wrong, please read the following paragraph every morning before breakfast. It is from James Harvey Robinson’s enlightening book The Mind in the Making. “When we are wrong, we may admit it to ourselves. And if we are handled gently and tactfully, we may admit it to others and even take pride in our frankness and broad – mindedness. But not if someone else is trying to ram the unpalatable fact down our esophagus. Carnegie says you need to show respect for other’s people’s opinions and not say “You’re wrong” if you wish to make friends and influence people. The other side to that coin is to admit you’re wrong when you are. “When we are right,” writes Carnegie, “let’s try to win people gently and tactfully to our way of thinking, and when we are wrong – and that will be surprisingly often, if we are honest with ourselves – let’s admit our mistakes quickly and with enthusiasm. Not only will that technique produce astonishing results, but, believe it or not, it is a lot more fun, under the circumstances, than trying to defend oneself. This is our charge … to not be argumentative. In fact, this can be tested by attending the Oklahoma Health Care Authority Forum on June 21 from noon to 1 at the Methodist Enrichment Center, 6th and Quinn. This is the time for you to voice your concerns about all health care issues. Nicely. Without argument, right? And if you just want a fun evening, go out to L&M Arena, north of Guymon a little ways, and watch kids on their horses competing in the L&M Play Days. The upcoming ones are June 21 and 28 starting at 6:30 pm. It’s free and it’s fun to watch. 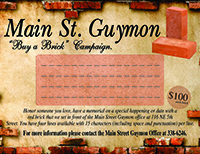 There’s a couple people that I really need to give a SHOUT OUT to … Roger and Julie from Long and McKinnon, my neighbors here at Main Street Guymon. They saw I wasn’t getting my plants put in the planters out front and they did it! Roger even waters them when I’m being the bad plant lady or gone. Good neighbors are so awesome.